Whether it’s the holidays or your bestie’s birthday coming up, finding the perfect gift for that special creative person in your life can be a little tricky. What if they already have plenty of watercolor sets (disclaimer: that’s pretty much unheard of) or what if they already have tons of sketchbooks? Or what if you just don’t know where to start in terms of looking and just need some quick recommendations to get you started? 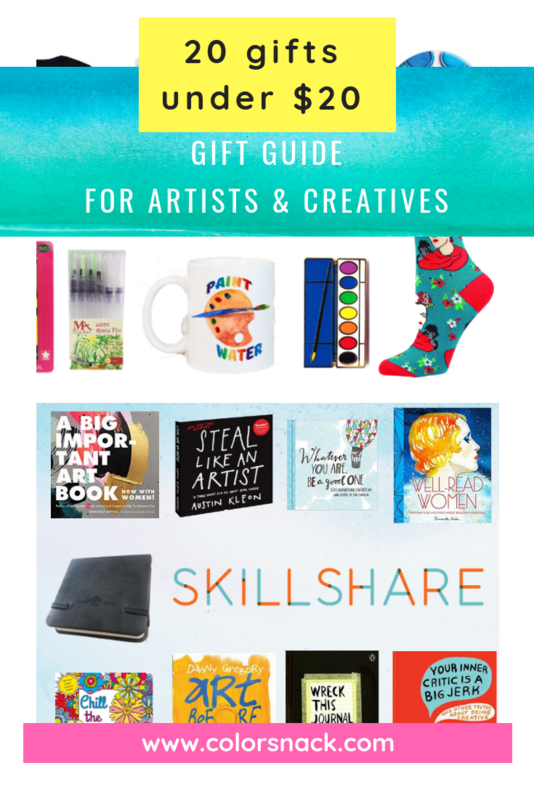 This is exactly why I wanted to put this little guide together – to help you find the perfect gifts for artists that are not only awesome but also affordable. Most of these items I have personally used and absolutely love and stand by them. Be like Leslie Knope and be a winner at getting the perfect gift for your artist friend, creative, or art lover! This is a collection of gift ideas for your artist friend who may be in need of new art supplies. And honestly, an artist can never have too many of these, so if they happen to already have these art supplies, they will be delighted to get another set because these are all amazing products that you can come back to time and time again. You know what instantly makes you the best gift giver ever? Getting a set of these for (yourself!) that special creative artist in your life. Why? Because glitter makes EVERYTHING ten times cooler! These various shades of gold watercolors are a perfect tool for embellishing and adding more awesomeness to your already awesome watercolor sketch. I’ve used these for a variety of projects (adding pizzazz to my business cards, making lettering pop, adding gold accents for highlights or shadows, you name it and I’ve probably used the gold watercolors on it). Sample art using these gold watercolors can be seen here. 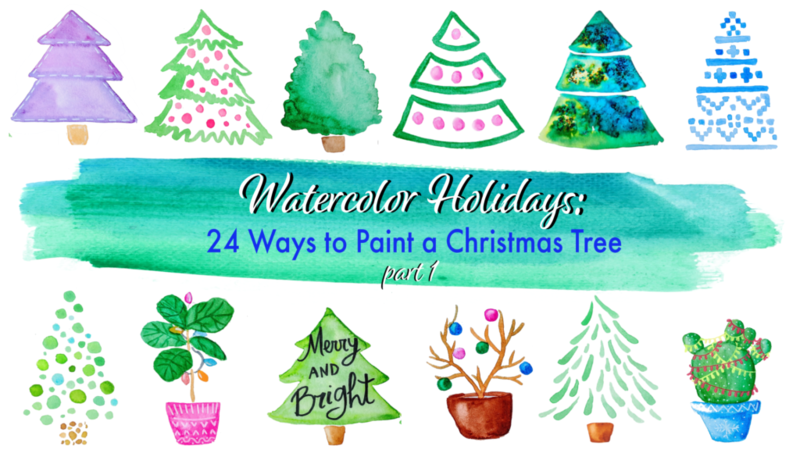 I’ve recommended water brushes before in my blog post on how to get started with watercolors, and since then have discovered this awesome brand of MozArt water brushes! They are great for artists of any level because you can fill the containers with water which makes painting with watercolor super easy. You can also use these with watercolor pencils or other water soluble media. 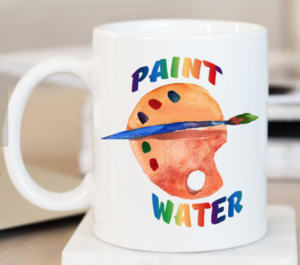 So instead of worrying about dipping your paint brush into your cup of coffee or tea, you can fill up your water brushes with water and get to sketching. They are fantastic for sketching en plein air, urban sketching, or just playing around with watercolors during a commercial break from your favorite show. I’ve used mine for over 5 months now and I like that the container doesn’t get dirty, nor blocked. And you get 6 of them for $10, what a steal! (oops, did I just add this to my amazon cart as well?). I love my posca paint markers! They are awesome to add highlights onto any of your sketch and the white comes up super bright and clear. You can use them in tons of creative projects like writing out lettering, or outlining your lettering to make it pop. You can also add accents to your abstract art in form of dots, lines, or squiggles. I made this lettering art piece with posca markers! Microns are some of my favorite ink pens because they dry super fast (so perfect for lefties) and do not run if a watercolor wash is applied. They are great for outlining a certain part of a sketch, for creating hatch lines, or adding various texture to your art. And did I mention that they don’t smudge? They are truly an indispensable product for an artist, illustrator or sketcher. And this set comes with ink pens of various sizes which is bonus and hella cool when you need to vary up your sketch stroke. Here are some sample sketches I’ve done with micron pens. The next section of this gift guide is great for anyone who loves and appreciates art, wants to keep being creative or someone who just needs a little push to get unblocked and tell that negative self talk to take a hike. I own and have read and loved these books and so I truly think they will be a great gift for your artistic or creative friend. This is one of my favorite books because it puts the idea of creativity in simple terms – you can and are creative. You just gotta look around. It also shares the positive message of just being yourself and the fact that original art doesn’t exist. It’s also a fairly quick read, but jam-packed with great insights and call to action for creatives and artists. We all struggle with negative self talk and often are our biggest critic. This book has been monumental in helping me get art work done. It’s written in an encouraging voice that is not only supportive but also assertive and inspiring to go get that canvas or sketchbook and make some art happen. Self-doubt doesn’t stand a chance with the insightful chapters of this book. It’s also another lighter read and can be enjoyed in a weekend or a cozy Sunday afternoon (the chapters can be skipped around according to your most urgent artistic needs). This is the book that gave me permission to be a sketchbook artist without having to follow any “rules” that go into sketching. It is full of fun exercises to get you into sketching and seeing your world differently. Suddenly everything around you can be sketched and anything can become art. The illustrations are super colorful and inspiring and will get you craving to start making art right away! Every art lover will appreciate the beautiful watercolor portraits of famous women in literature. It’s a gorgeous book with inspiring quotes in artistic lettering style and it makes a perfect addition to a creative’s library. I love this book filled with beautiful illustrations and lettering from the artist Lisa Congdon. The quotes are all inspirational and perfect to read on a Saturday morning when you know you have some art work to do, but just can’t even. Flipping through just a few pages will invigorate the mind and soul of any art lover or creative. Oh my Frida! These socks are amazing! I have a pair of these and love to wear them every time. There’s lots of other artistic sock options, but these I think, take the cake. 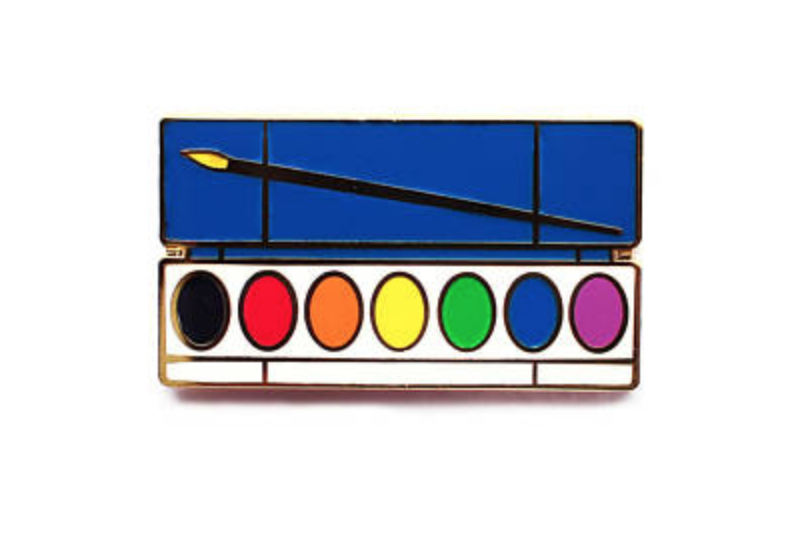 This is the cutest little artist pin I’ve seen to date. Super awesome quality. I couldn’t resist and got one for my friend too! Speaking of friends, here is a shirt that my friend Bree designed. It’s a great little reminder for yourself (or your art friend) to keep showing up, to keep creating, to keep being. I don’t personally own this (yet) but it is such a fun mug and anyone who’s ever dipped their brush in their coffee or tea will definitely appreciate the humor! This blog post has been updated in November 2018 with new & additional gifting ideas for artists. This book quickly became one of my favorites because it an art book all about WOMEN artists. So if you had a female artist in your life that is seeking some encouragement and resilient stories of how other women grew their art careers, this art book is for you (and your friend!). I also love the little art project ideas that Danielle includes with each chapter. In case you aren’t familiar, Skillshare is an online membership site where you can watch tons of fun classes on all kinds of subjects. It is truly the gift that will keep on giving because there are always new classes being added on all sorts of subjects (and the creative ones are definitely my favorite). I have a few classes on there myself and I hope you’ll give them a try :). This is one of my favorite tiny, compact AND cute watercolor sets that I always take with me when I travel. I especially love this color combo from Prima Watercolors – Pastel Dreams. It is truly dreamy and a joy to play around with (especially if you have flight anxiety and need something creative to do while you travel/fly). One of my all time favorite journals that I’ve ever purchased is the Wreck This Journal by Keri Smith. It’s a magical journal that will help you get out of your creative rut, start creative destruction of paper and give you a jolt of creative flow like never before. Seriously, one of the prompts is something like taking your journal and throwing it out of the third floor balcony. This gift is great for a certain someone you might already know (hey, no judgement here) who hoards tons of art supplies and beautiful paper or sketchbooks but who just can’t bring themselves to start creating. This journal makes it easy and super fun to start. It removes the pressure and kindly guides you to just start doing something creative. I highly recommend it. Are you on the popsocket train yet? Ok, hear me out on this one. I know they’ve been around for a while but lots of people still surprise me when they say they’ve never used one. It makes using a phone SO much easier and it also creates a mini stand for it so if you want to watch a video hands-free, you can totally do it. Now, there’s so many freaking options you can get for these! Possibilities are endless. Here’s one of my favorites (created by yours truly) which instantly inspires some creativity and art action. If you want to see a few other popsockets I designed, visit here.